Grain-free diets for pets are extremely popular in the pet food industry right now, much to the befuddlement of many veterinarians. 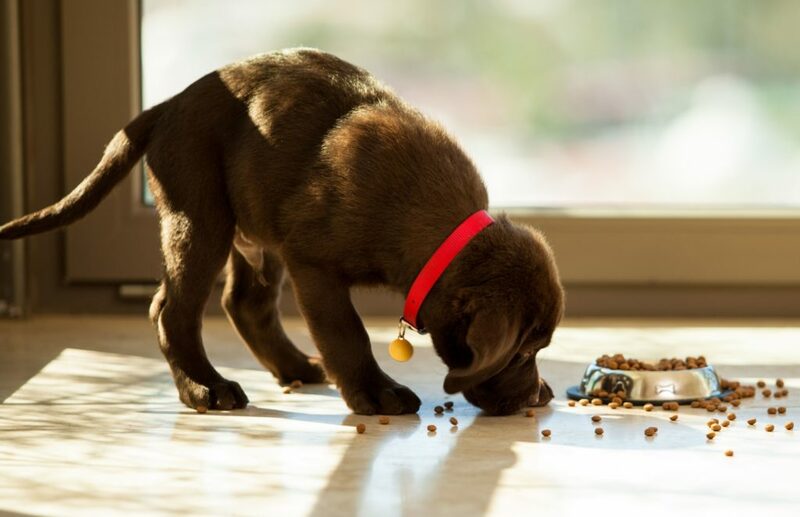 Avoiding grains in dog food is unnecessary for a number of reasons. 1. Dogs can eat carbs. Dogs can eat carbs. The idea that wolves eat raw meat in the wild is often used to justify grain-free diets in pets. The problem with that logic is that dogs are not wolves. Dogs were domesticated by humans between 14,700 to 36,000 years ago1-2, and they are a completely different species from wolves. In the thousands of years they’ve been living with humans (and eating our scraps), dogs developed a much different GI tract from wolves. They have ten canine-specific genes with roles in starch and fat metabolism that were altered from their wolf ancestors, increasing the amount of amylase they produce and allowing dogs to eat more of our starch-rich diet.3 This means that dogs are meant to eat some carbohydrates, along with protein and fat. Dogs are omnivores. 2. Even grain-free foods contain carbohydrates. Even grain-free foods contain carbohydrates. The “grain-free” variety of carbohydrate sources, such as potato or peas, often contain less nutrients than their “grain” counterparts like corn, which contains proteins and fiber in addition to starch.4 Traditional dog food containing corn or wheat may actually be more nutritious for our pets. 3. Grains are not inherently harmful to healthy dogs. Grains are not inherently harmful to healthy dogs in any scientifically proven way. If a patient has been diagnosed with diabetes, then they may need to eat a high-protein/ low carb diet, but keep in mind that the term “grain-free” does not mean carbohydrate-free. If you’re concerned about food allergy, a grain-free diet is almost certainly not going to help you. In the small percentage of pets that have a food allergy (about 10% or less of itchy dogs), the most common allergens are beef, dairy, and chicken.5 It’s very rare for pets to be allergic to a grain. If you suspect your pet has a food allergy (either because they have gastrointestinal problems or skin/ear problems) then you need a hypoallergenic diet trial, performed under the guidance of a board-certified veterinary Internal Medicine specialist (for GI disease) or Dermatologist (for skin/ear disease). It will work better with a specialist guiding you, because secondary conditions like infections have to be managed concurrently to tell if the diet trial is helping. Go to dermvets.com to schedule an appointment in interested. 4. New evidence has shown that grain-free diets may be harmful to some dogs. New evidence has shown that grain-free diets may be harmful to some dogs. A possible association has been found between dilated cardiomyopathy (a heart condition) and eating grain-free diets in Golden Retrievers. More research needs to be done, but it certainly raises concerns. If your dog is healthy, you can probably feed them any commercial dog food that you buy in a store. Dog food production is regulated by the U.S. Food and Drug Administration (FDA) and the Association of American Feed Officials (AAFCO), so they make sure commercial dog food is balanced with all the vitamins and minerals that pets are supposed to have. If your dog is not healthy, talk to your veterinarian about which nutrition options are best. They know more about canine nutrition than employees at pet stores, dog breeders, or “internet crusaders”.